Production of polyester fibres using cleaned bottle flakes as raw material consumes approx. 80% less energy*, and emits 70% less CO2* and 40% less water* than the production from petroleum. Knowing that it takes about 700 years for a PET bottle to decompose, and that approx. only 10% of all PET bottles are recycled, there are many reasons to use recycled PET fibres. The recycling process begins with a PET bottle already been used. It is cut into small pieces, and then cleaned in a hotwater process to remove dirt, then sorted and extruded to polyester fibres. Recycled PET is widely used on consumer products such as: carpets, T-shirts, underwear, fleece etc. 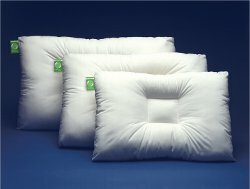 Fipatec Clean & Green focuses of the green aspects of using recycled fibres in mainly fiberfill products. Fiberpartner has developed a concept with labels and folders to attach to the product with information for consumers - helping manufacturers to show these advantages to the end-users of pillows, duvets etc. Recycled polyester fibre is in the process of transforming from a cheap alternative to a consumer demanded quality product. Fipatec ® Clean and Green is a range of quality polyester fibres available as solid, hollow, hollow conjugated fibres (HCS) - also available with AEGIS antibacterial finish. Clean & Green is a quality filbrefill, washable and non allergic. All Fipatec Clean & Green has Oekotex 100.